Intel wanted to offer a CPU paired with a powerful integrated GPU for a long time, but the company didn’t have the GPU tech that could follow the power of their CPUs. 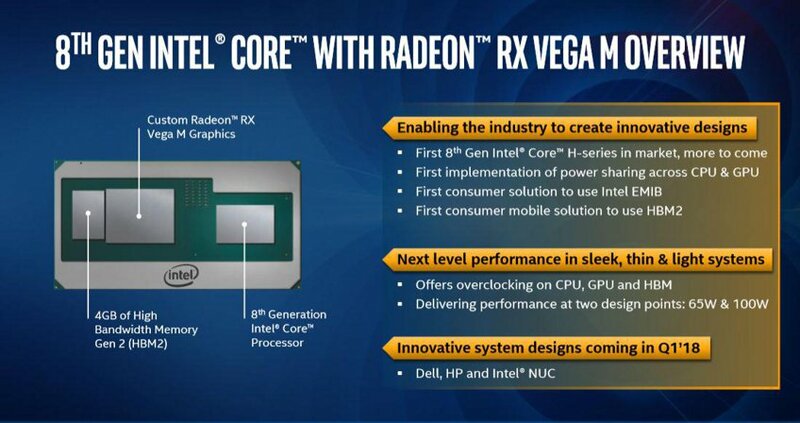 It all ended with Intel deciding to use graphics chips from AMD, their biggest rival, and we finally have official info regarding the first fruits of the latest collaboration. There are five models in total, and they come with graphics chips that pack a power between 2.6 and 3.7 teraflops and come with 4GB of superfast HBM2 memory. All five models are based on the Kaby Lake architecture, but they all have an 8 in their name telling us that they are considered 8th gen. There are four Core i7 models and one Core i5 model. 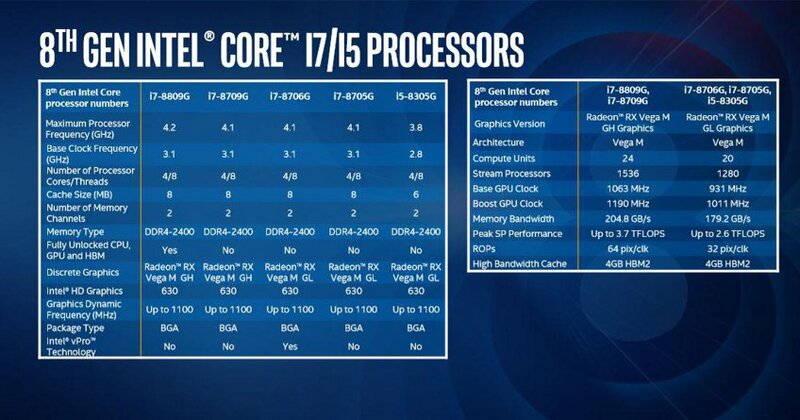 What’s interesting is that all CPUs come with four cores and eight threads, even the Core i5 one. As you probably know, Core i5 series CPUs usually do not come with Hyper-Threading enabled. You can see all details on the slide below. All of them feature G-series branding, and all come with a custom Vega M GPU. The i7-8809G and i7-8709G come with the more powerful Vega M GH variant, while other three models feature a slightly slower Vega M GL GPU chip. The faster variant comes with 24 compute units, 1536 Stream processors and up to 3.7 teraflops of power, while the Vega M GL comes with 20 CUs, 1280 Stream processors, and up to 2.6 teraflops of power. Models with the Vega M GH have 100W TDP rating (CPU+GPU), while other three have 65W TDP rating. At the moment, all five models are targeted towards notebook market, bringing excellent graphics power to laptops. The slide below shows how the new solution is noticeably faster in games than the GTX 1050 and the GTX 1060 Max-Q (a stripped down GTX 1060 version for laptops), which is a result worthy of respect. Intel will offer a simple solution that takes a small amount space on the board, and that offers superb gaming performance, for a mobile chip. 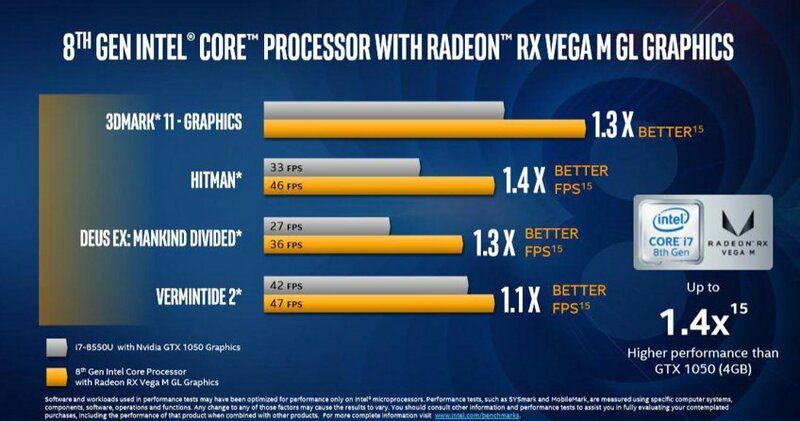 Of course, we will have to wait for real-world benchmarks before we are completely convinced in performance shown on the slides. Now, all CPUs also come with Intel HD graphics that will be used for less demanding tasks, saving some power. 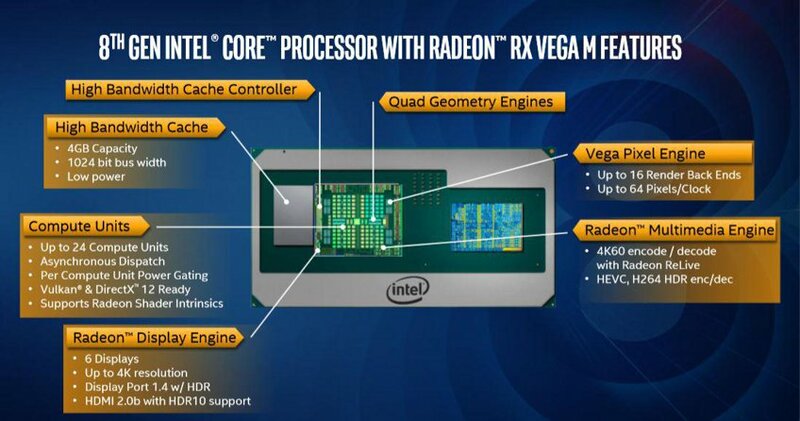 Also, while the graphics chips are part of Intel product, driver updates will go through AMD, with Vega GPUs supporting a full array of AMD-exclusive features like FreeSync, WattMan, ReLive, and others. Intel didn’t reveal the pricing, but it is known that the CPUs will launch during Spring of 2018.